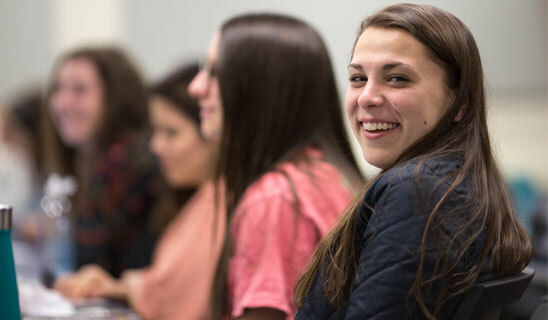 The Pitt Business Outside the Classroom Curriculum (OCC) provides students with a clearly defined pathway of extracurricular experiences in business that they should complete as college students. Built like a game with progressive levels of challenge and rewards, the program is fun, engaging, and impactful. It gives students a way to easily identify which activities they should complete, organize their categories of participation, and track their cumulative progress in real time. Created to complement our academic curriculum, the Pitt Business OCC prepares students to become well-rounded business professionals. All students are strongly encouraged to participate, as the data shows that our highly engaged students earn more and are more employable than non-active peers. The Pitt Business OCC is comprised of 10 competencies that help students to succeed in their first destination after graduation. The competencies were created in consultation with the school’s leading employers, based on their feedback on which skills they find most desirable in new employees. The Pitt Business OCC is comprised of extracurricular and co-curricular activities, events, projects, and membership in student organizations. Each of these “activities” is linked to specific developmental competencies that are identified by the Pitt Business Career Development Office. Each activity is associated with points, badges, and levels. Students receive points for completing an activity. The standings are updated on a leaderboard where students can compete against their peers. Students can earn achievement badges in various categories for completing a set of activities. Badges exist for levels, competencies, student organizations, and more. After prescribed activities are completed across different competencies, a student “levels up” to a higher level. More points are awarded for activities completed at the higher levels. Students receive rewards for completing levels and those who reach the highest stage are honored at graduation. Level 1 – Exposure – Like an intern, Level 1 provides basic exposure to the selected competency. Level 2 – Participation – Like an associate, Level 2 ensures participation in activities to contribute to a project or organization. Level 3 – Engagement – Like a manager, Level 3 develops the next level of skill and engagement to further your expertise in a given competency. Level 4 – Mastery – Like a director, Level 4 ensures you have developed all the skill necessary to be considered a master at a given competency. Students who “level up” in the Pitt Business OCC are eligible for gifts that recognize their hard work and achievement. The Pitt Business OCC provides important professional development to students and complements the academic curriculum. Create Your Account in Suitable Today!